Distinguish, differentiate, compare and explain what is the main difference between Solar and Lunar Eclipse in science and physics. Differences and Comparison. An eclipse is known to occur when one celestial body partially or totally obscures another. There are two eclipses that are visible from the earth, which is, the solar eclipse and the lunar eclipse. A lunar eclipse occurs at night whereas the solar eclipse occurs during the daytime. There are only certain times when either of them can occur. A lunar eclipse can only occur when the moon is directly opposite the Sun in the sky – a full moon. Even though there is a full moon each month, obviously a lunar eclipse does not occur on a monthly basis because the Sun isn’t exactly in line with the Earth and the moon. The moon’s orbit is actually tilted 5 degrees more than that of the Earth; otherwise, we would see a lunar eclipse each month. A solar eclipse happens when the moon gets in the way of the sun’s light and casts its shadow on Earth. That means during the day, the moon moves over the sun and it gets dark. This total eclipse happens about every year and a half somewhere on Earth. A partial eclipse, when the moon doesn’t completely cover the sun, happens at least twice a year somewhere on Earth. 1. In the solar eclipse, Sun is blocked. 2. 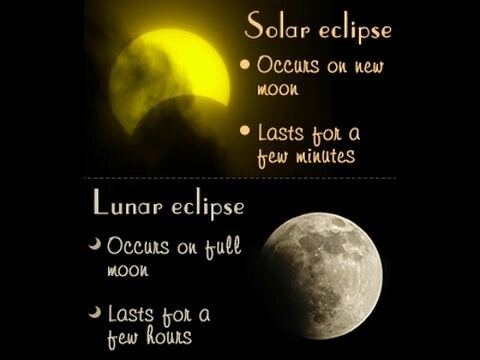 The solar eclipse happens during the day whereas lunar eclipse happens at night. 3. In the solar eclipse, Moon’s in the middle. In the lunar eclipse, Earth’s in the middle. 4. The solar eclipse happens during a new moon. The lunar eclipse happens during a full moon. 5. The solar eclipse covers only a small area so few see it. The lunar eclipse can be seen by everyone that can see the moon.